↑ ক খ Zaubidah Mohamed (25 January 2005). ↑ Toh Chin Chye (1989). 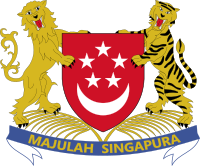 ↑ Second Schedule of the Singapore Arms and Flag and National Anthem Rules (Cap. 296, R 1, 2004 Rev. ↑ ক খ "National Coat of Arms". ↑ "Singapore Circulation Coins: Second Series".